pt_introduction(n) 1 tcllib "Parser Tools"
Welcome to the Parser Tools, a system for the creation and manipulation of parsers and the grammars driving them. What are your goals which drove you here ? Do you simply wish to create a parser for some language ? In that case have a look at our parser generator application, pt, or, for a slightly deeper access, the package underneath it, pt::pgen. Do you wish to know more about the architecture of the system ? Is your interest in the theoretical background upon which the packages and tools are build ? See the Introduction to Parsing Expression Grammars. At the top we have the application and the packages using the packages of the layer below to implement common usecases. One example is the aforementioned pt::pgen which provides a parser generator. In this layer we have the packages which provide the core of the functionality for the whole system. They are, in essence, a set of blocks which can be combined in myriad ways, like Lego (tm). 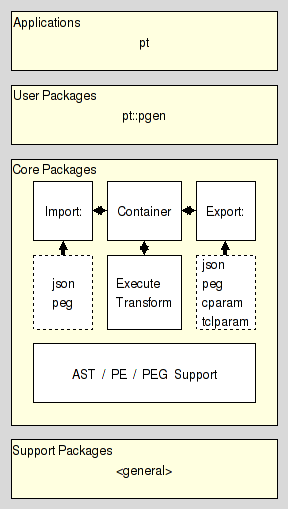 The packages in the previous level are 'just' pre-fabricated combinations to cover the most important use cases. Last, but not least is the layer containing support packages providing generic functionality which not necessarily belong into the module. This layer is further split into six sections handling the storage, import, export, transformation, and execution of grammars, plus grammar specific support packages.